Stucco homes can be seen more readily in certain parts of the United States like California, Arizona, New Mexico, and even Texas. This might be because these particular places are influenced more by Spanish and Mexican architecture. Stucco is both an architectural style and a material used to build these structures. Since the late sixties, however, a new material—with a far more contemporary look—resembling stucco has become a favorite of homeowners everywhere. Synthetic stucco is a highly demanded and popular choice for homes. So what is the difference between the two and what makes synthetic stucco a good choice? Let’s look at this great material and how it can enhance your dream house. What is the difference between traditional and synthetic? Traditional stucco is comprised of Portland cement, water, and lime applied to a wood or stone structure. Synthetic stucco— sometimes referred to by the acronym EIFS, which stands for Exterior Insulation and Finish Systems—is a multi-layered exterior finish that’s been used in European constructions post World War II. Traditional stucco is more prone to cracking. If you push on a traditional stucco wall, you will feel it more rigid, while the synthetic is softer with a little more give. When you look at the layering of each, stucco will have wire mesh and synthetic will have a foam core. If you tap synthetic stucco, it will sound more hollow than solid. It is typically believed that synthetic stucco arrived in the United States around 1969. It was really in the 1980s that the material started appearing more frequently as an exterior finish in commercial buildings and soon after in residences. The most recent versions of the building material have six layers that bond and form a non-breathable covering. They are composed of a water-resistive barrier, adhesive, foam insulation, base coat, reinforcement mesh, and the finish. The important thing to remember is to avoid moisture seeping into these layers, as it can become trapped. Synthetic stucco has many benefits to homeowners. When it was first developed in post-war Europe, it was being used to patch walls and rebuild so much of the destruction that had occurred after the war. Builders quickly realized that the material was quite energy efficient. EIFS is a better insulator because of its many layers and therefore offers more protection against the elements and is actually more sound proof. Its multiple layers are part of what makes this material appealing. This material is also very moisture resistant, which is a big plus; this means long-lasting durability and dependability. It is also far more flexible, which allows ornate keystones and other accents that traditional stucco might not be able to hold. Synthetic stucco also does not fade or yellow as easily—something that is often a problem with traditional stucco and requires repainting. Synthetic stucco also looks great! That’s another plus. Its unique aesthetic draws in homeowners that are looking for a sleek modern exterior. Synthetic stucco comes in a variety of colors and can vary in texture and finishes. 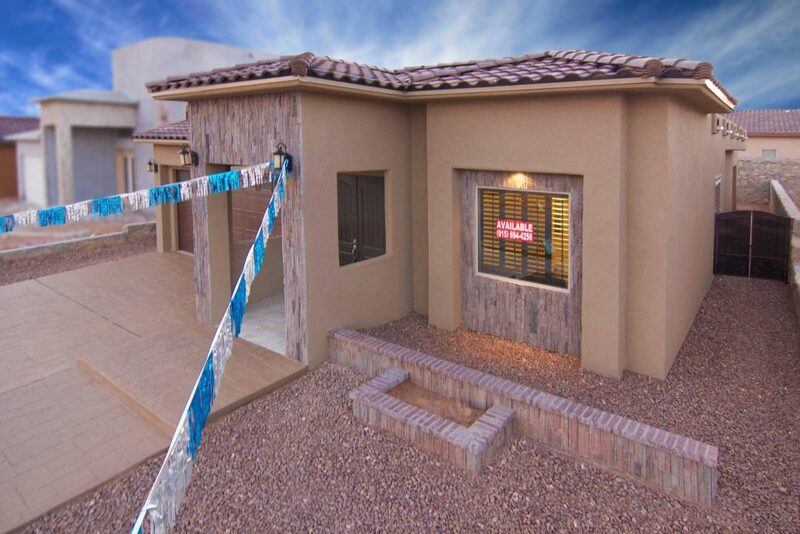 Santana Homes can build your beautiful home with a synthetic stucco exterior so you can reap all the benefits of this create insulating material. It’s a modern, energy-efficient, and dependable part of your new dream home. Call us if you have any question on this or other home exteriors we offer.